Preface. 1. Dislocations and internal stresses (V.L. Indenbom). 2. 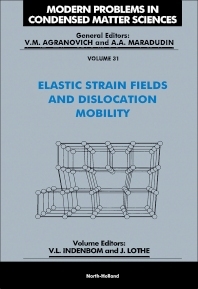 Dislocations in continuous elastic media (J. Lothe). 3A. Crystal lattice effects (J.P. Hirth). 3B. The microscopic theory of cracks (V.L. Indenbom). 4. Dislocations in anisotropic media (J. Lothe). 5. Dislocations interacting with surfaces, interfaces or cracks (J. Lothe). 6. Dislocations emerging at planar boundaries (A.Yu. Belov). 7. Uniformly moving dislocations; surface waves (J. Lothe). 8. Dislocation motion over the Peierls barrier (V.L. Indenbom, B.V. Petukhov and J. Lothe). 9. Thermally activated glide of a dislocation in a point defect field (V.L. Indenbom and V.M. Chernov). 10. Dislocation glide and climb (V.L. Indenbom and Z.K. Saralidze). 11. The phonon-dislocation interaction and its role in dislocation dragging and thermal resistivity (V.I. Alshits). 12. Dislocations in irradiated crystals (V.L. Indenbom and Z.K. Saralidze). Author index. Subject index. Cumulative index. This volume aims to provide a thorough treatment of the phenomena of elastic anisostropy and a discussion on dislocation mobilities. The book presents a wide treatment of these topics, and includes descriptions of detailed theoretical models to describe dislocations and cracks, and moving dislocations. An overview is given of the physical behaviour resulting from dislocation mobility in materials, such as glide and climb, interactions with point defects and the behaviour of dislocations under radiation such as creep and swelling. Academy of Sciences of the U.S.S.R., Moscow, U.S.S.R.